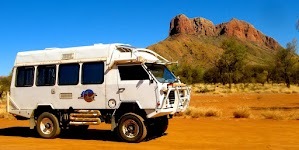 As we travelled the rough roads across the Gulf Of Carpentaria from Burketown to Booroloola, we noticed a drip of red oil from the power steering box. Checking the hydraulic fluid level revealed that the level had gone down about 1 inch. There was nothing that could be done on the side of the road except to top up the reservoir and carry on, mindful of the fact that on a Oka, the power assistance for the brakes also comes from the same hydraulic power source as the steering, so a loss of hydraulic pressure could be quite serious. 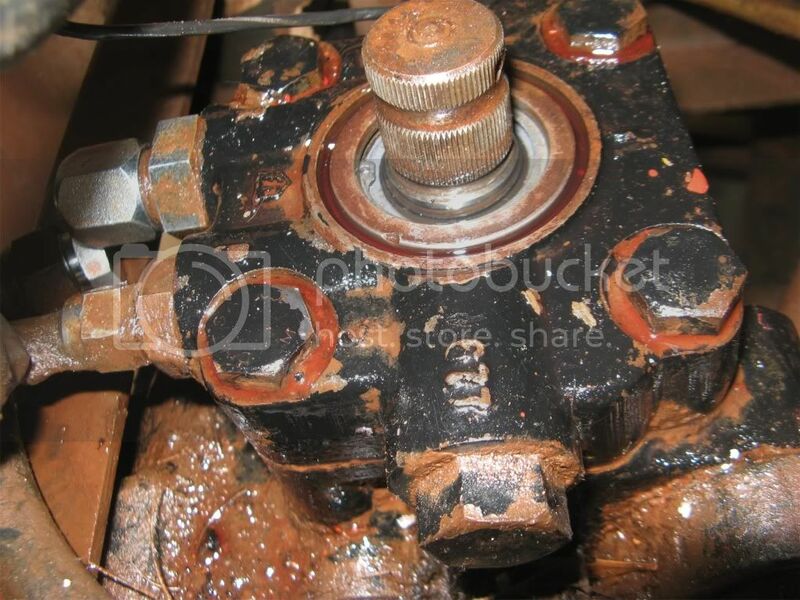 By Booroloola the leak had got worse and was traced to the seal around the input shaft on the top of the steering box. After a long search, we bought a 4 litre can of fluid from a mechanic in Boorloola, the last fluid in the town it would seem. 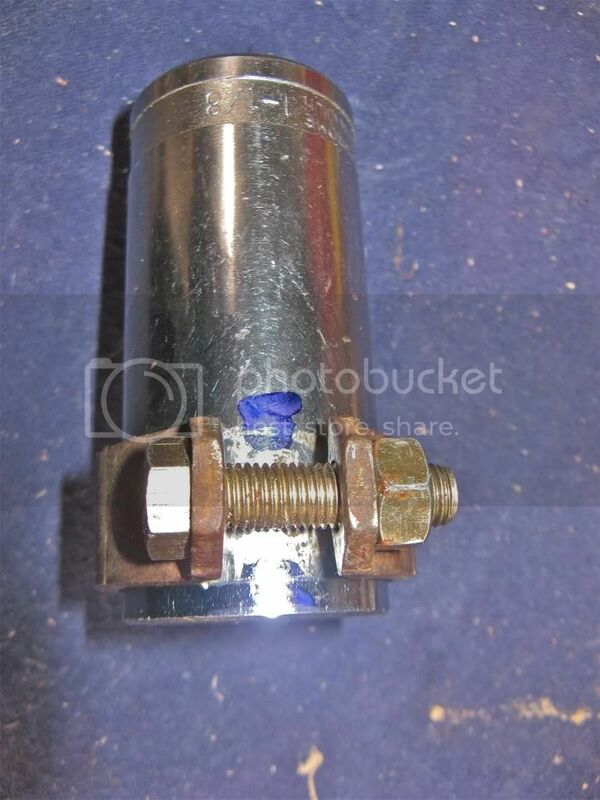 [Note: After doing this fix, it appears that that a major steering failure from a leaking seal on the input shaft is unlikely, unless the reservoir runs dry]. Red fluid oozing from the steering box. On the stretch from Booroloola to Katherine, the leak stabilised but it was still losing about 250 ml a day, but what was worse was that the fluid dribbled down the outside of the steering box and was then liberally sprayed by the wind over the chassis, springs and eventually down the side of the Oka where of course the dust stuck to it, creating a sticky mess. We covered the steering box with a modified wine cask bladder to stop the dispersion of fluid but something permanent needed to be done, which could only happen after got home a month later. The steering box fitted to later Oka's (or as an Oka mod to replace the earlier Kirby-Bishop steering box) is a TRW TAS-30 box made by TRW Torfinasa, Spain. You won't find much data on this model which was fitted to a number of European small trucks. However, it is similar in style and operation to other TRW TAS series boxes so information on the TAS-40 to TAS-85 range is quite relevant. 11) spin the engine for a few seconds but don't allow it to start (disconnect the wire to the fuel cut off solenoid on the injector pump). 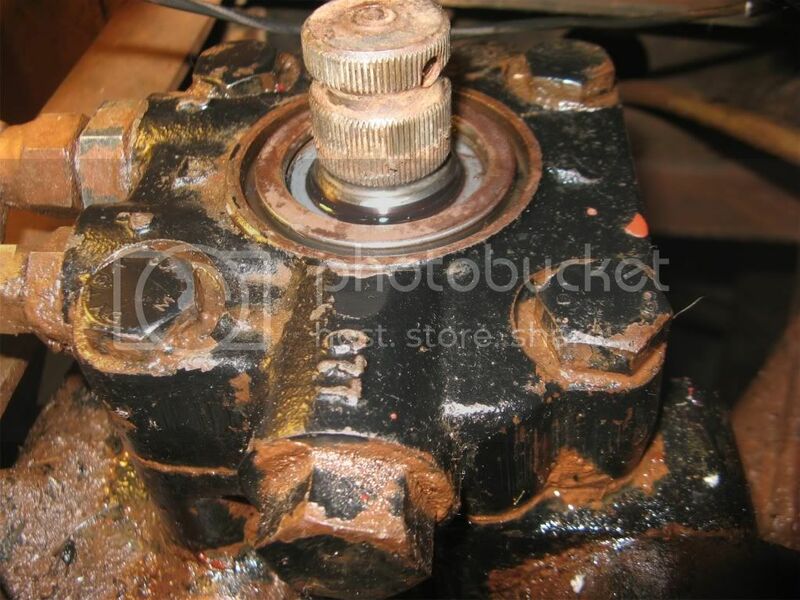 This builds up pressure in the hydraulic system and pops out the seal. Refitting the UJ prevents it shooting skywards. When you hear a "pop" as the seal pops out, stop spinning the engine immediately to reduce fluid loss. 12) remove the UJ and towelling and the old seal. The old seal was not damaged but the sealing lip had completely worn down (compared with the new one) and was barely making contact with the input shaft. 13) clean up the top of the steering box and reinsert the new seal, spring side downwards, grey side upwards. (This requires a special tool, plus some care to avoid inserting the seal too far. You can easily make a suitable tool, see notes below). 19) do a road test to exercise the steering box (carefully, the brakes are hydraulic powered as well as the steering), check for leaks and recheck the reservoir level. Do this several times over a few days. 1) An input shaft seal kit seal kit. I acquired this kit (part number TAS75/C1) from the local TRW importers, Complete Steering Australia Pty. Ltd, Phone (03) 9369 2659. They were familiar with the Oka steering box and the seal kit was around $80 delivered. This sounds a lot but it contains the seal, dust/dirt cover and new spring clip, plus a couple of other items not needed for this fix, and it's difficult to source from elsewhere. 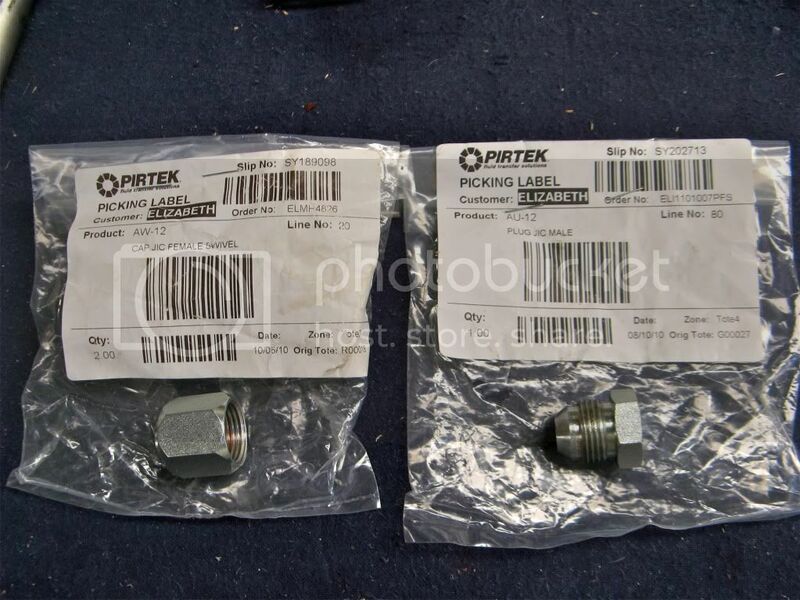 2) 2 hydraulic fittings, a Ryco S56-12 or Pirtek AU-12 male plug, and a Ryco S65-12 or Pirtek AW-12 female cap, or equivalent (about $5 each). Hydraulic pressure is used to force the old seal out and these are for temporarily capping the return outlet on the box to create internal pressure, and plugging the return hose to prevent fluid loss. Cap and Plug for the blanking off the return outlet and hose. 3) A special tool for inserting the seal. You can buy one ($US36 from the USA plus freight, assuming the J37073 is the correct size, or around $A100 quoted locally), or you can quite easily make something similar, as it's only a stepped cylinder. The TRW manual warns against using a socket to insert the seal since if you go too far it won't seal, and might require removal and disassembly of the steering box to recover it, which is a big job. However you can use a socket if you adapt one to prevent this from happening. A long socket modified to avoid inserting the seal too deeply. 4) A couple of litres of Automatic Transmission Fluid (Dextron 111 or equivalent) to replenish the reservoir. 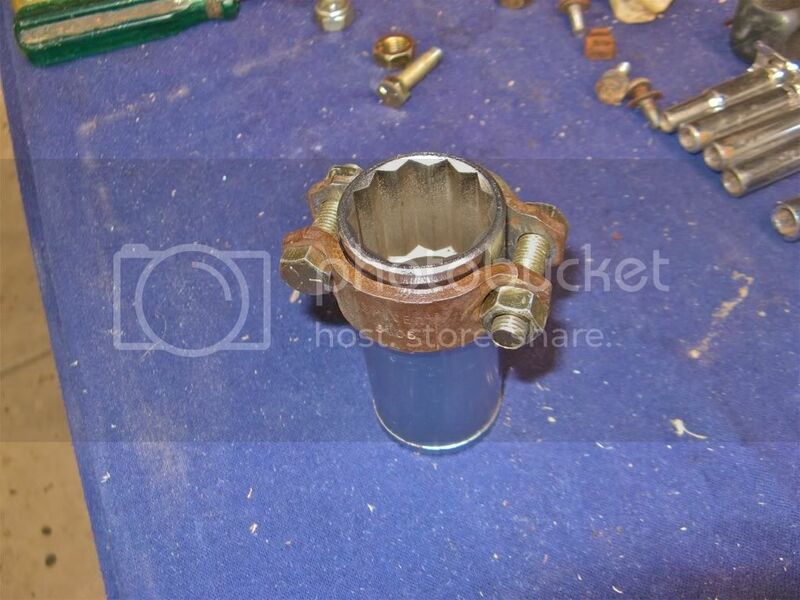 You'll need a fairly deep socket, long enough internally to surround the input shaft plus a bit, and small enough in diameter to just fit inside the seal housing. A long, 1 1/8 inch A/F, or metric equivalent would suit. To that you can fit some clamps to prevent the socket from penetrating too deeply. Only 4.3 mm depth is required. You may notice that the clamps I used are actually some old Oka saddle clamps from drive shaft rear UJ's, which I opened out a bit and bolted across the socket. You could easily make some similar clamps using 3mm steel bar. I did try hose clips but they are not wide enough to sit on the seal housing and are not flush on their lower edges. About 4.3 mm depth is required, no more. After removing the circlip from above the old seal, I "calibrated" the modified socket by locating it over the input shaft and nipping up the clamp bolts while it was resting on the old seal. That gives it the correct depth. Make sure the clamps are then securely tightened as you don't want them to slip up during insertion of the seal and overdo things. It's better to leave things a little short than to drive the seal too deep. Follow the instruction above, or in the TRW documents. They are similar but I've added some practical tips. These photos may also help. Old seal exposed after removing the circlip (or spiral spring clip in our case). The return hose and outlet plugged. Using the socket to insert the new seal. It was a little bit squeezy wielding the hammer above the inlet shaft (a slightly shorter socket would have been better), but it doesn't need too much force, and it's a good thing anyway if it prevents the seal from going in too far. In my case the seal didn't go in quite level so I had to tap the socket on one edge to level it up. The seal must only be inserted far enough for the circlip to fit fully in its slot. The circlip located in its slot above the new seal. After putting the new circlip in, I removed and replaced it a couple of times to ensure that it really was fully in the slot. You don't want the seal popping at the wrong moment and distributing fluid all over the Oka and road, and leaving you without steering or brakes. If the circlip is not quite in its slot, put the socket back on top of it and tap it down gently until it seats properly. 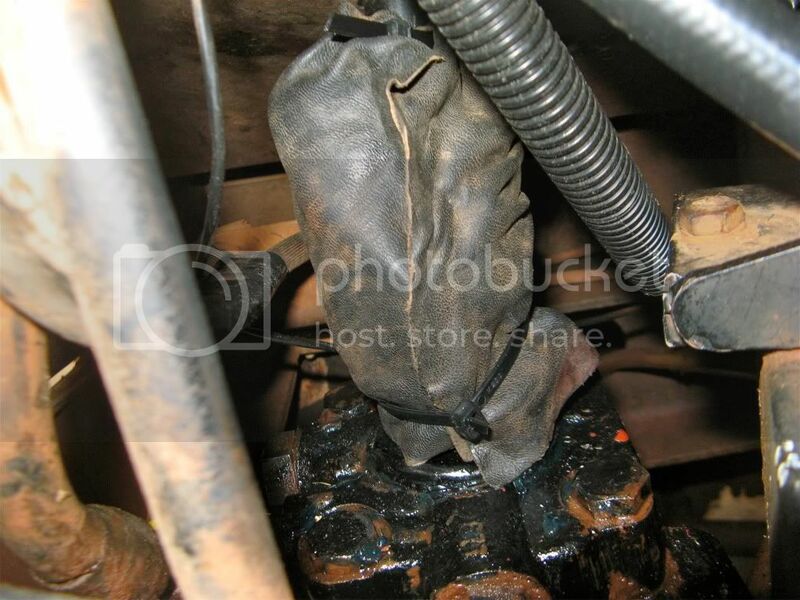 Remove the plug and cap from the return hose and quickly reconnect to the steering box, to reduce fluid loss, and tighten fully. To aid the bleeding process, and before reconnecting the steering column shaft and lower UJ, I ran the engine several times briefly as per the instructions, checking the reservoir level in between. 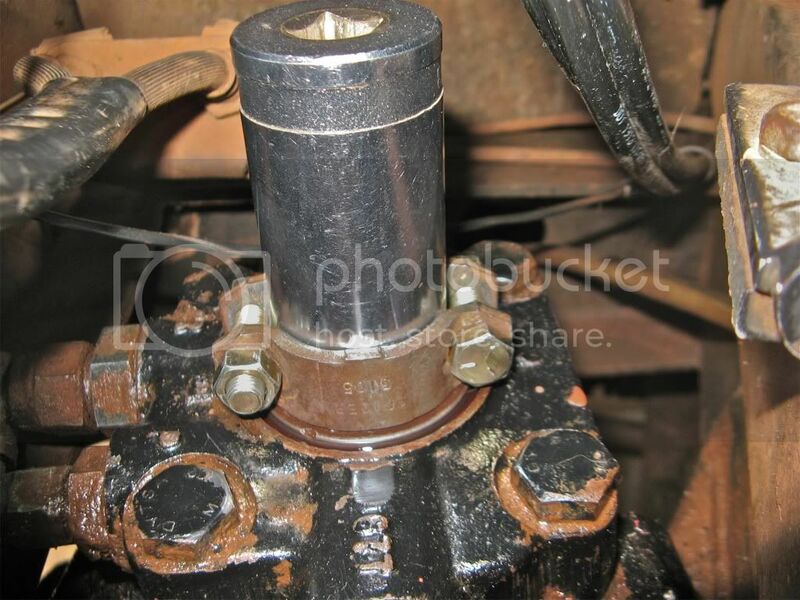 Ensure there are no more leaks, from the input shaft or return hose, then grease and refit the new dust/dirt cap. If all is OK, then you can fit the lower UJ and steering column shaft. The seal and dust cap in place, with blue grease under the cap to keep out water. The steering column shaft can be replaced without disturbing the steering wheel housing but needs to be manually compressed and expanded as it's fitted to the splines at each end. 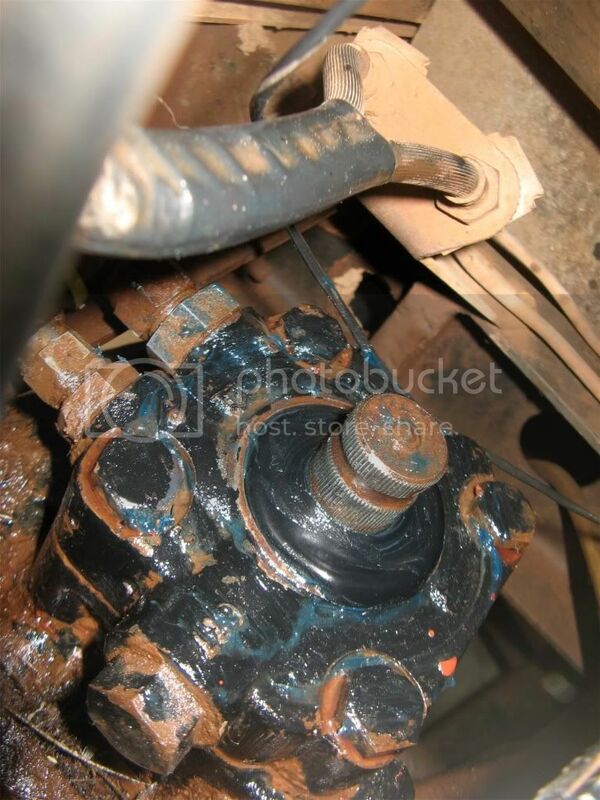 It's better to leave all the pinch bolts off until the shaft and lower UJ are in place. Being able to slide the shaft up and down the spines makes fitting it a bit easier. Ensure that the steering wheel is aligned with the front wheels in the straight ahead position before assembly. The lower UJ back in place with safety locknuts fitted. I fitted Nyloc nuts plus extra locknuts to the UJ bolts to ensure they never, ever work loose. When refitting the steering shaft, according to TRW, the UJ's should be in phase to avoid cyclic binding. I never knew I suffered from cyclic binding but apparently it can occur where there are 2 or more UJ's in the steering shaft and they are out of phase. "Steering column assemblies with more than one universal joint (cardan type) can cause a cyclic binding feel or torque variation at the steering wheel if the u-joints are not in phase with each other". I presume being "in phase" means that the UJ cross shafts are parallel, like in this photo, but they don't explain. 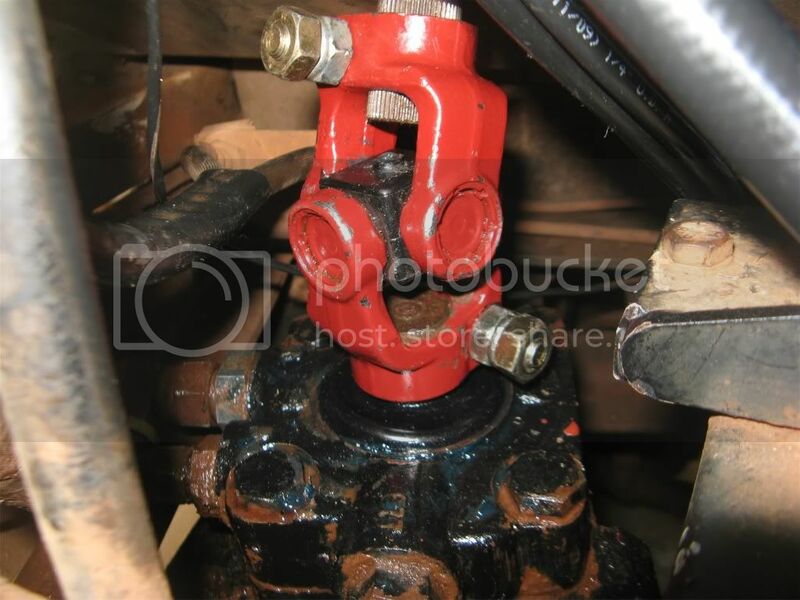 (Note: the urethane bush clamped to the siding shaft is to reduce steering column rattle, which works well and could easily be installed at this point, see this article). 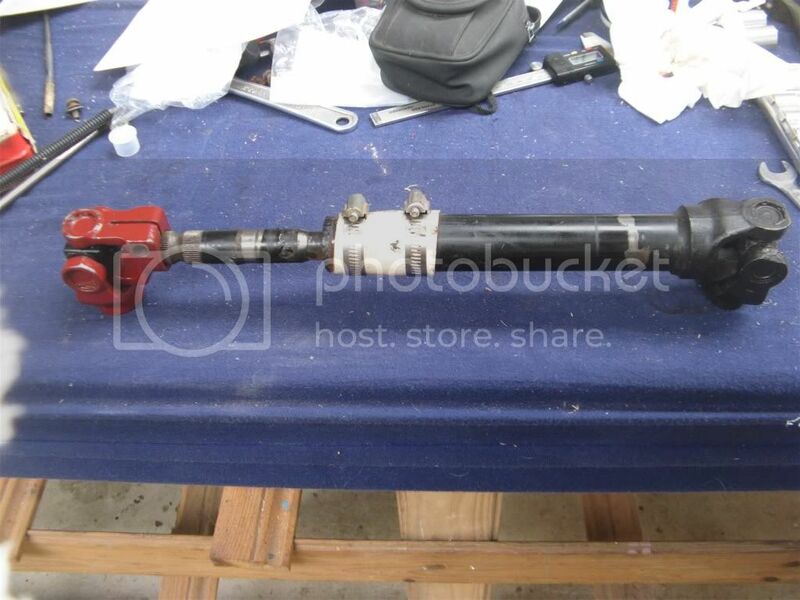 Steering shaft with UJ's in phase, I think. 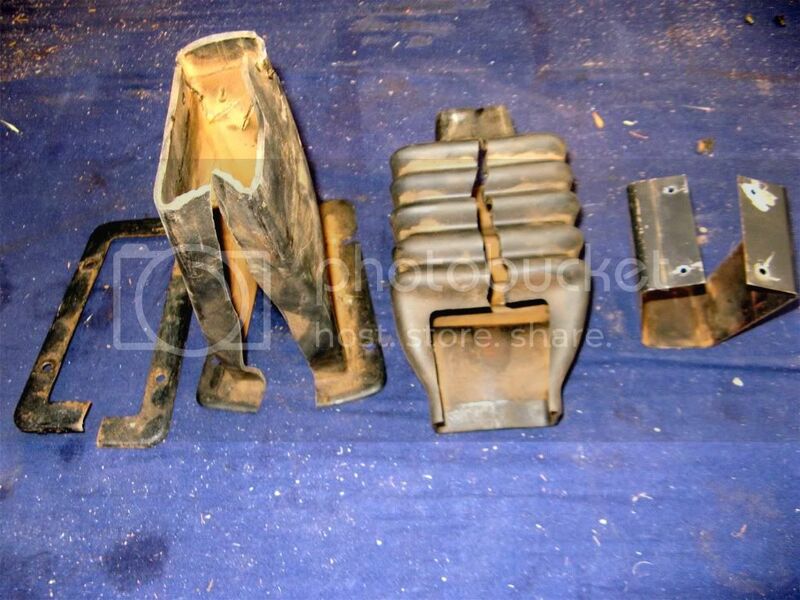 Replacing the rubber boots and steel framing brackets is easier if they are first slit/cut up the back. 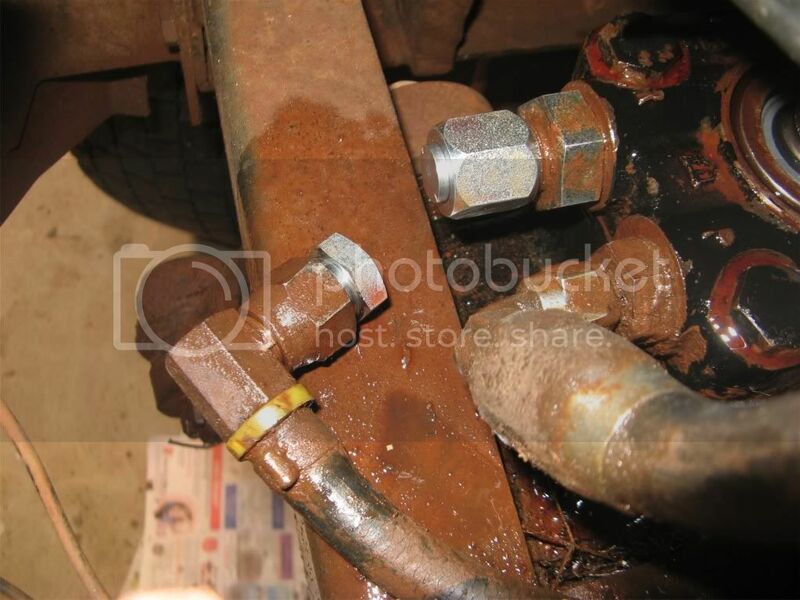 You don't then need to slide them over one end of the steering shaft where they get in the way of reconnecting it. The steel clamps should hold them in place but they can be super-glued if you need to. Rubber boots, slit up the back to aid assembly. I also fitted a leather boot to the the lower UJ to protect it from the worst of the dust and water. Leather boot to protect the lower UJ.